Yesterday I spoke at the “Custom Media Day” event in New York. About 110 people were in attendance, all from a variety of roles in large and small media companies. One theme that came up again and again was the iPad. And it is clear to me that the iPad – today – is an opportunity that needs to be addressed. If you wait, it becomes a threat. Media companies should have learned this in the past 20 years – they waited to establish web-centric organizations, product lineups, and revenue streams, and suffered because of it. Custom publishers have often relied on print media such as magazines as a core part of their business. Sure, we’ve all asked about whether “digital slates” would shift the marketplace, but those questions were often framed in a distant future. Now, everyone’s perspective is changing. Because of the iPad, we KNOW the future will include this new medium. Those who are more apprehensive are asking “if” they need to address it now, or “when” will the adoption rate be significant enough to begin developing content for the iPad. Of course, the answer to those questions is: the time is now. If you wait for everyone else to transition their business to include products and content for the iPad, it is not only a product differentiation they have over you, but an organizational differentiation. Start building those muscles from an organizational standpoint – considering how content is different, how sales is different, how interaction is different, how marketing is different. Do experiments now – even if they are small scale and don’t deliver any business value. It’s better to learn in that manner now, than to wait, and bank the future of your company on your very first iPad venture 2 years down the road. It is a new medium, one that will require different types of products, content, and interaction. Learn what those differentiations are to your current lineup of products and services. Don’t look along traditional lines, such as only judging what magazine apps are doing on the iPad. Look at lots of games, at sketching apps, at productivity apps, at anything that requires interaction. Understand how these iPad work individually, and within the framework the iPad experience. Don’t look at how you replicate what you do now, look at what needs and behaviors make sense to address. Understand how the competition will be able to outmaneuver you before they do. 20 years ago, newspapers would never have considered a free service such as Craigslist a threat. They would have cited bandwidth limitations, internet adoption rates, trust about online commerce, the cost of servers, and the inability for one man to scale a local service into a national phenomenon. And, while they may have been right when it comes to facts on paper, they essentially bet on all the wrong horses. That has cost the newspaper industry billions, taking away a primary source of revenue. Sitting on the sidelines with the iPad simply gives others room to explore and accept the possibilities before you do. The biggest change the iPad will bring is not external to your company. Too many media companies underestimate the challenge of organizational change. This has a huge cost not just in dollars, but time. Most media companies are still grappling with how to evolve for the web. We are 15-20 years into the Internet age, and you still hear about reorganization after reorganization as media companies try to align their offline strategies to online strategies. Don’t underestimate the role of developing the mindset, skillset and organizational structure your employees need. Investing in the iPad will inherently be about investing in your employees. 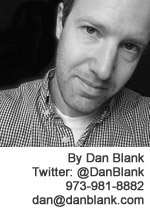 Let me know if I can help you in growing your business: @DanBlank, 973-981-8882 or dan@danblank.com.